After weeks of wrangling, the 15-member U.N. Security Council unanimously adopted a resolution Thursday aimed at attracting more troops and money to stabilize Iraq and put it on the road to independence. The vote was an important diplomatic victory for President Bush, giving him new credibility as he seeks support for the occupation and reconstruction of Iraq, reports CBS News Correspondent John Roberts. Mr. Bush, speaking in San Bernardino, Calif., thanked the Security Council "for unanimously passing a resolution supporting our efforts to build a peaceful and free Iraq." Secretary of State Colin Powell called the vote "a great achievement. The U.S. won the support of war opponents France, Germany, Russia and Syria after circulating five drafts of the proposal. All four countries made their support known only hours before the vote Thursday morning. Washington also won backing from China and Pakistan, and finally — and most surprisingly — from Syria, the only Arab nation on the Security Council and a staunch opponent of the U.S.-led war. 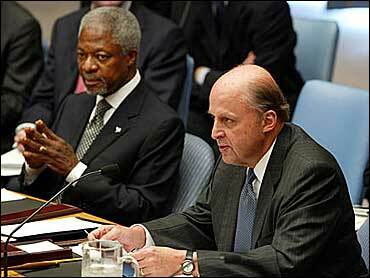 U.N. Secretary-General Kofi Annan said the vote showed the commitment of the Security Council "to place the interests of the Iraqi people above all other considerations. The U.S. effort was aimed at getting more international funding and troops to ease the American burden in Iraq. But German and French officials said their support for the resolution did not mean such help would be forthcoming. The resolution authorizes a multinational military force in Iraq under a single command led by the United States, and calls for troop contributions and "substantial" financial pledges from the 191 U.N. member states. It also makes clear that the U.S.-led occupation of Iraq is temporary and states that "the day when Iraqis govern themselves must come quickly." It calls for the U.S.-appointed Iraqi Governing Council to give the Security Council a timetable for drafting a new constitution and holding elections by Dec. 15. Even some Democrats, who had harshly criticized President Bush for previously shunning U.N. involvement in the occupation, say the resolution means Iraq is now the world's problem. "They're now invested," said Sen. Joe Biden, D-Del. "A failure now in Iraq is the world's failure, not just a U.S. failure." But others were unmoved by what they saw as baby steps toward internationalizing Iraq and again took aim at the president's case for war. "Before the war, week after week after week after week, we were told lie after lie after lie after lie," said Sen. Ted Kennedy, D-Mass. A group of prominent Democrats lined up Thursday to oppose the president's request for $87 billion to rebuild Iraq, accusing him of a failed policy. And if Iraq has become the central front in the war on terror, Kennedy said the president has only himself to blame. "Iraq was not a breeding ground for terrorism. Our invasion has made it one," Kennedy said. White House officials hope the unanimous U.N. vote will deflect perceptions on the ground in Iraq that the occupation is a strictly U.S. venture, but it's not likely to yield much in practical terms. Big allies are still reluctant to send troops, and fundraising may bring in only a fraction of what's needed. Thursday night, President Bush heads to Asia, where he'll urge nations to support his policies on Iraq. But many of those countries remain deeply divided over the war and, beset by their own growing problems with terrorism, may find it politically difficult to step up to the plate.